Cape Town - The Springboks have dropped one position back to third spot in the IRB rankings after the completion of the Rugby Championship. South Africa finished their campaign with a 32-16 loss to the All Blacks in Soweto, while Australia's 25-19 win over Argentina in Rosario helped the Wallabies edge past the Boks on the IRB world rankings. They have 85.92 ranking points, still well behind leaders New Zealand (93.35), with South Africa third on 84.69. England (83.09) and France (83.03) are fourth and fifth respectively. Rugby Championship winners, the All Blacks, further increased their rating to sit well clear at the top. They are also unbeaten for 16 successive Test matches and closing in on the record (18) held by Lithuania. 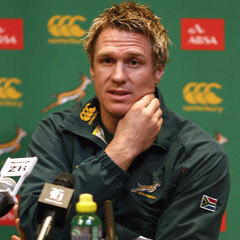 South Africa also finished behind Australia in third spot on the Rugby Championship log. Both teams finished on 12 log points each but the Wallabies claimed second spot courtesy of one more victory (3 wins). Argentina's Pumas brought up the rear of the log after failing to win a game in their debut season in the southern hemisphere competition. They remain eighth on the rankings, but are now less than a point above Scotland.